The LEGO Ideas Voltron set has made me nostalgic for all the Giant Robot TV shows I watched as a kid back in Japan, not least of which was the fantastic Gundam. 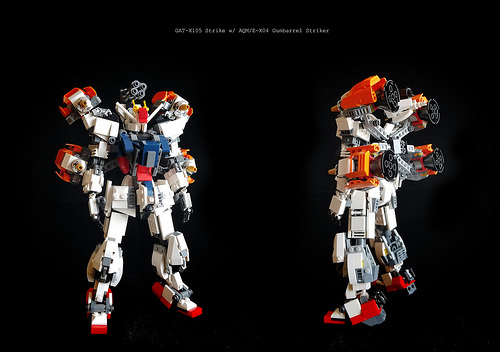 Two Rabbits shares my love of all things big and stompy, and demonstrates that passion with a series of really excellent Mobile Suits, kitted out with extra gear like the AQM/E-X04 Gunbarrel Striker pack with Strike Gundam from the SEED series. 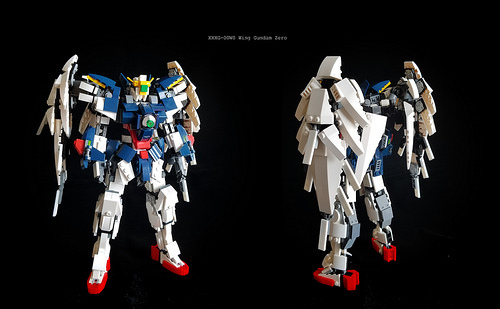 Beyond the rocket engines and weapons pods, the highly detailed frame itself is worth a closer look, with great shaping on the legs and torso, topped with the iconic Gundam head. From the Wing series, the XXXG-00W0 Wing Gundam Zero features gorgeous angel wings and completely different detail on the mecha frame.